Although the guidance found here will help you with the basics, if you require further support please get in touch with the Technology Enhanced Learning Team by emailing telsupport@aston.ac.uk to request training. There are of course many types of assessment and the appropriate assessment type for you module should not be dictated be the tools listed here. 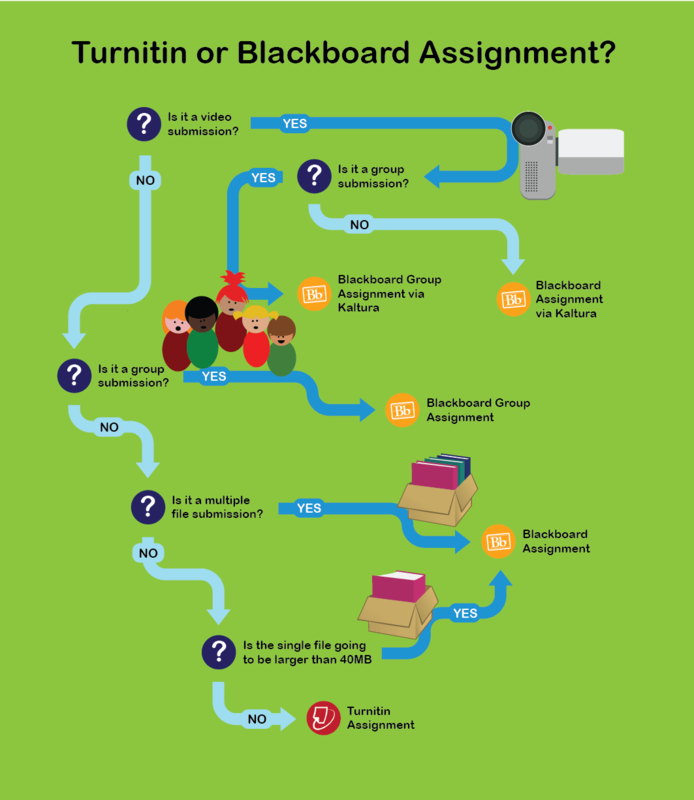 However the majority of assessments at Aston are submitted via either Turnitin or Blackboard Assignments. Below is a general rule of thumb guide to which of these 2 tools is best to use for your assessment. If you are in any doubt as to which tool to use, please get in contact with the Technology Enhanced Learning Team by emailing telsupport@aston.ac.uk. Once you have decided which tool is best for you, follow the 1st steps guides below for the specific tool. Please note that if you are a tutor in either Aston Business School or Languages and Social Sciences you do not need to create your own submission points for any assessment listed in the module descriptor. The relevant programme support team will create them for you. It is suggested that there is value in you understanding the process of creating the submission points, in case you wish to setup a draft submission. It is important to note that Blackboard also has a Tests feature which is often used for Formative and Summative assessments. There is a short 1st steps guide below on setting up Tests. Within Blackboard there are a number of other tools that can be used to support student assessment. These include Blogs, Wikis, Journals and Discussion boards. General Assessment Regulations, Policies and Guidelines can be found in the A-Z of Academic Regulations, Policy & Procedures. This decision chart is focused around submission factors. It is an overview to help you make the choice of which tool to use based on the type of submission that students are required to make. It does not deal with other factors such as the type of feedback you would like to give. For that sort of advice please get in contact with the Technology Enhanced Learning Team by emailing telsupport@aston.ac.uk. Turnitin is independent of Blackboard, but is fully integrated. This integration extends the capabilities of Blackboard by offering additional e-submission, e-feedback and online peer assessment tools. For guidance on using Blackboard tests for credit-bearing assessments please contact the Quality Officer for your school. Details can be found on the Quality team website. Expand the “Who we are” section. Before you deploy a test you are encouraged to contact the Technology Enhanced Learning Team by emailing telsupport@aston.ac.uk. Any grades that students see outside of My Aston Portal (MAP) should be thought of as provisional. Only final Exam Board approved grades will appear in MAP. Students often find it difficult to access electronic feedback. For Turnitin please direct them to take a look at the Accessing Feedback Studio Guide and the Feedback Studio Overview. For Blackboard Assignments please direct them to the My Grades Guide.